Helping Hands Quilt Shop, Berlin’s original quilt shop, was founded in 1974 when Emanuel Mullet, tired of always having the living room filled with a quilt in frame and no room to entertain guests, suggested that his wife Alma move her quilting hobby into his recently vacated building. The hobby soon grew into a business and at the age of 58, after raising a family of nine children, Alma Mullet cleaned, painted and hung out a little sign which read “Helping Hands Quilt Shop”. As the business prospered it became apparent that more space was needed. In 1997 the public library next door was torn down and a new building was built to accommodate the quilt shop’s expansion, and remains Helping Hands’ current location. In May 2011, Helping Hands was purchased by the Dennis Mullet family. Along with the experienced staff members they hope to preserve the Amish Country quilting traditions in Berlin while at the same time growing to accommodate new ideas in the quilting market. 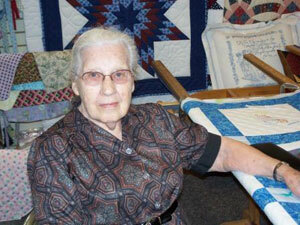 In the early years of Holmes County it was out of necessity that the art of quilt making was practiced. Scraps of fabric not big enough for any other use were stitched into creative patchwork blocks and sewn into sentimental pieces of art that were necessary to the sleeping warmth of entire families. Today, quilting is still a sentimental art; however, many of today’s quilter’s pick and choose their fabrics carefully in order that the colors may blend and compliment each other, or showcase boldly contrasting colors. At Helping Hands Quilt Shop you can expect to find everything you need to create your masterpiece, whether you’re building your stash for that rainy day scrappy quilt that is reminiscent of the roots of quilting, or if your coordinating fabrics for a specific project the knowledgeable staff will be happy to assist you in making your dream become a reality. In addition to having over 3,000 bolts of fabric, we also stock a wall with notions, rulers and other quilting tools conducive to straighter seams, better corners and faster production. If you need inspiration on design, come in and browse over 100 locally made finished quilts, as well as pillows, wall hangings, crib quilts, potholders, centerpieces, table runners and much more! Or find a book or pattern that will explain in detail how to create your project. If you know what you want and can’t find it on our racks we will be happy to custom make almost any quilt for you. If you’re lucky enough to visit Helping Hands on the last Tuesday and Wednesday or first Tuesday of the month you will find the Amish ladies chatting away as they hand quilt on a quilt that will either be sold on our sales floor or is being custom quilted for a customer. Whether you enjoy the process of creating your own quilts or you enjoy the finished product, Helping Hands Quilt Shop is the place to accommodate all your quilting needs.